So for the last few years, I have made up a Make Nine post on Instagram and here but each year I never get round to finishing the items on the list. So I’m trying to put a little more thought into it this year and come up with something that I will actually achieve. I bought this coat pattern on Boxing day and am planning to make up a version of it at some point in the first quarter of the year. I will probably have to adjust the sleeves on this too. Once I have received this book I want to get my teeth stuck into making myself a soft shell jacket – I always have problems with RTW ones as they always have sleeves that are too small for me. I really need to get a move on with this shawl as the provisional wedding date is in May – I brought the wool, needles and beads with me to Christmas but forgot the Tambour hook that I need to put the beads onto the wool. I cast this on on Christmas Eve and am on the second column although I have a feeling progress will slow down after the Christmas period. I am probably going to try and hack Butterick B5997 to try and make a top like this one in the photo and add a few more niceish tops to my wardrobe – suitable for dinner or drinks. I am on the lookout for some decent stretch denim to make myself some super comfy jeans. I think that I will invest in a kit for this, I did try making a version of this but as it is missing underwires and the fabric had too much stretch it didn’t really work very well. Good luck with this! I love the coat but it’s on my ‘life’s too short’ list along with jeans. Coats are a funny thing where I live – you either need something padded to death like a ski jacket or no coat at all. I’ve decided to stick with RTW jeans because I am a boringly regular size and can’t imagine being able to make some that fit me as well as the ones I can buy. One of my daughters, on the other hand, might benefit from some made to fit jeans so maybe I should go for it on her behalf. Lol well I can totally see the logic behind your “life’s too short list” but unfortunately both the boat and the jeans are there because I find it hard to find ones that fit properly. The Ginger Jeans fit me really nicely after a small bit of modification to remove a chunk for my Sway back, the instructions are really simple and I made mine with bar tacks, instead of rivets and a button instead of a “proper” jeans button which made them much easier to construct. If you ever do go for it I would def recomend this pattern. 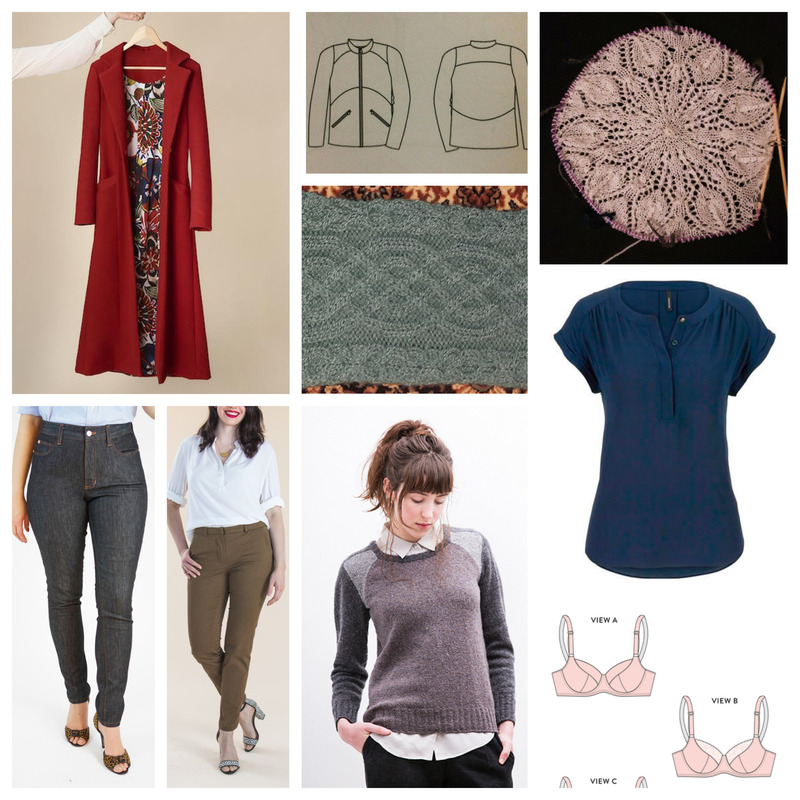 I will – that definitely seems to be the favourite jeans pattern in blogland. Good luck. Some nice makes, but to me the thought of making a bra is super scary – mind it sounds eminently sensible as getting the damn things to fit is always a nightmare. I have managed to copy a sports bra from Primark, twice now, when the material died. But I haven’t got as far as a proper one, lets see how far I get this year. A good mixed list. It all looks very achievable, you just need unlimited crafting time! We will see how many I actually achieve. I’m all for simple most of the time. And tbh I wear jeans for their fit not for the look really.